Contrary to popular myth, dogs are omnivores, not carnivores. This means that they can, and should eat a variety of nutrients and fresh ingredients. From a species classification perspective, dogs are in the order Carnivora and do have the significant canine teeth, shorter digestive tracts, etc. common to most species within the group. However, so does the giant panda, an animal which eats exclusively bamboo! These carnivorans (or members of this order) are therefore very diverse. There is no absolute definition of the term ‘carnivore’, but most people think of obligate carnivores, or those species that eat exclusively meat, when they hear this term. One might call the dog a facultative carnivore, or adaptive carnivore, but the term ‘omnivore’ illustrates to most people that dogs eat meat out of preference, not necessity (and that they do very well on diets with quality plant ingredients). In addition, most of the enzymes, energy conversions, and the like in the dog’s body are much more closely related to humans, than to obligate carnivores such as cats. Diverse nonessential, but beneficial nutrients, for example ‘phytonutrients,’ are found in plants and not animal tissue (which is primarily fat and protein, and not very complex). Many studies show the benefits of such plant substances in the health of dogs when fed regularly. 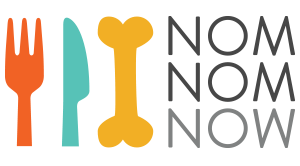 NomNomNow never adds inferior ingredients, and the plant material you’ll find in our foods delivers energy, nutrients, and bioactive compounds. The diets are also high in meat content and quality, using only the finest cuts of human-grade products. Through Dr. Justin Shmalberg's guidance, we've been able to provide a diet that perfectly meets all of our dogs need, while providing a complex nutrient profile for optimal health.